Carbon based materials include nanographites, conducting carbon nanomaterials, carbon nanotubes, graphene oxides, nanodiamonds, hybrids like carbon nanotubes embedded into polymer composites or functionalized molecular groups. These compounds are being implemented in multiple architectures with versatile chemical bonding, organization and morphologies leading to the unique physical properties such as exceptional electrical, thermal, structural dependent dimensionalities, mechanical and tribological performances. For instance, pure diamond is an excellent electrical insulator while some graphite based materials are more or less good electrical conductors, depending on their composition and pre-treatment. Carbon and graphite foams are very good thermal insulators, even at very high temperatures. On the other hand, diamond is used for the heat sink in electronics due to its very high thermal conductivity. Mechanical properties of carbon materials also differ considerably, depending on the type of the material. Since carbon allotropes and hybrids materials may contain different chemical bonding, multi-functional compounds can be tailored for various applications in nanoelectronics, integrated optoelectronics, energy storage and conversion, sensors, biomedicine, etc., being both already implemented in working devices and currently under development. Intrinsic electronic features originating from doping or structural defects critically contribute to physical properties of carbon-based materials. These features may be exhaustively characterized by various electron magnetic resonance techniques including continuous wave (CW) or pulse electron paramagnetic resonance (EPR), electron nuclear double resonance (ENDOR) and other advanced electron magnetic resonance methods. Using a variety of complementary EPR techniques provides detailed insight into the local environment and the electronic peculiarity of defect structures in carbon-based systems. Moreover, extraordinary sensitivity of EPR techniques to the relaxation times (both spin-lattice and spin-spin) of paramagnetic species as well as the capability of selective control and detection of defects paves the way for the understanding of spin dynamics, which is extremely important in quantum computation or implementations of non-volatile memory devices. Thus, EPR techniques, based on different instrumental functionalities and methodologies, due to their specific window of time scales allow probing structural and electronic features of intrinsic and engineered spin systems in carbon based materials with the aim to open new challenges toward advanced and emerging technologies. 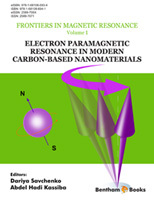 The Volume 1 of Frontiers in Magnetic Resonance comprises 13 chapters on topics of high importance in the field of electron paramagnetic resonance study of carbon-containing nanomaterials. The topics and authors were selected from recently published papers in highly cited journals (Nat. Commun., Sci. Rep., J. Mater. Chem. C, Phys. Chem. Chem. Phys., Phys. Rev. B, Appl. Phys. Lett., J. Appl. Phys., Chem. Phys. Lett., Phys. Status Solidi B, Appl. Magn. Reson., etc.). The first chapter by Prof. S.K. Misra will give the reader the fundamentals of EPR spectroscopy in regards to its application to the carbon-containing materials. The focus of chapter 2 by Dr. A. Barbon et al. is set to the resolution of the EPR signals attributable to different species, or structures, that are present in graphite and graphene-like materials. Chapter 3 by Prof. L. Forró et al., presents the ESR characterization of spin dynamics of conducting carbon nanomaterials. In chapter 4, by Dr. V. Likodimos et al., the EPR spectroscopy is exploited to investigate spin dynamics of DWCNTs and composites of oxidized MWCNTs embedded in an elastomeric poly(ether-ester) block copolymer. Chapter 5 by Dr. rer. nat. E. Erdem et al., focuses on discussing EPR investigations on graphene oxide, reduced graphene oxide, and carbon nanotubes with different chemical functionalities. In Chapter 6, Dr. K. Marumoto reviews the ESR spectroscopy of semiconducting single-walled CNT thin films and their transistors. Chapter 7 by Dr. S. Ruthstein et al. describes the findings on the oxygenation processes of coal and graphene materials using in-situ EPR experiments at various atmospheric environments. In Chapter 8, Prof. A.B. Więckowski et al. describe the application of the two-temperature EPR measurement method to carbonaceous solids. In Chapter 9, Prof. P. Baranov et al. review the characterization of impurities in nanodiamonds by means of multifrequency CW and pulse EPR techniques. Chapter 10 by Dr.Sc. S. Andronenko et al. shows the application of multifrequency EPR to the study of SiCN nanoceramics. In Chapter 11, Prof. A. Kassiba et al. discuss the study of paramagnetic centers in SiC nanomaterials by means of CW and pulse EPR techniques. In Chapter 12, Dr. D. Savchenko reviews the size effects observed in EPR and ENDOR spectra of SiC nanoparticles and nanodiamonds. Finally, in Chapter 13, DrSc. E. Kalabukhova et al. review the EPR study of paramagnetic defects in amorphous a-Si1-xCx:H and a-SiCxNy thin films. We would like to express our gratitude to all the authors for their excellent contributions. We would also like to thank the entire team of Bentham Science Publishers, particularly Mr. Shehzad Naqvi (Senior Manager Publication) and Dr. Faryal Sami (Assistant Manager Publications), for their excellent efforts. We are confident that this volume will receive wide appreciation from students and researchers.